Corrosion of public lighting poles due to dog urine has become a major problem in many modern cities, where the number of these animals has been growing progressively over the years. According to the census of Madrid Association of Pet Veterinarians (AMVAC–acronym in Spanish–), there are 5 147 980 dogs only in Spain. The outdoor lighting company ATP solve deterioration due to dog urine through luminaries and poles built with technical polymers, which have among their properties the immunity to corrosion. Let's imagine a high quality and maintenance-free exterior lighting, with the latest LED technology to achieve minimum power consumption, which totally eliminates the risk of electrocution and also boasts a formidable esthetic presence. Any hotel would like to have such equipment, and that is exactly what is offered by ATP Lighting, the world's leading manufacturer of street lighting and urban furniture made from technical engineering polymers. To these revolutionary features, we must add the possibility of controlling the lighting of the hotel from any device with Bluetooth and the tranquility provided by a comprehensive warranty of 10 years, the longest in the sector. ATP, the specialist in the design and manufacture of immune to corrosion LED outdoor lighting made from technical engineering polymers, will present its most recent solutions at Expo Lighting America (ELA) 2019, on the stand 217. This year's edition, whose central theme will be the technological evolution and its application in public lighting, will be held on 5, 6 and 7 March at the Citibanamex center, in Mexico City, and it will bring together thousands of professionals of the sector. "Since its foundation in 1969, this company has been defined by a unique approach in the sector: identifying the main problems of outdoor lighting and solving them in an ingenious way through an intense R & D effort", explains Guillermo Redrado, COO of the company, in this year of commemoration. ATP Lighting, specialist in the design and manufacture of high-quality public lighting from technical engineering polymers, celebrates its 50th anniversary, which is a great opportunity to go over the concept of the brand and its evolution today. ATP has completed the total renovation of Egüés Valley's (Navarre, Spain) outdoor lighting, commissioned by the administration of the aforementioned municipality. The objectives of this project were numerous and demanding: achieve a high saving in energy consumption and maintenance costs, improve uniformity, luminosity and color rendering index, eliminate light pollution and reinforce citizen security, especially in the rural areas of the Valley. According to data from the City Council, with the new ATP lighting, the electricity consumption has been reduced by more than 60 %. 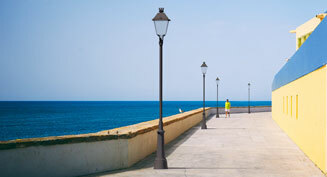 Proximity to the sea has always been a big challenge for outdoor lighting. Street lights on promenades, harbors, docks and other coastal areas are exposed to a humid and saline environment with a very intense corrosion power. The rapid damage generated by these conditions compromises the structural safety and mechanical strength of the poles, and breaks the hermetical seal of the luminaires, causing frequent breakdowns and performance alterations. ATP's LED immune to corrosion ensembles offer the ultimate solution to this problem. As ATP announced a few months ago, LED outdoor lighting family Aire® (series 3, 5 and 7) has obtained the certificates N, ENEC and CB for a voltage and frequency range of 220 - 240 V / 50 - 60 Hz and color temperatures from 2200 to 4000 K and PC Amber. These distinctions, obtained through AENOR after passing the corresponding tests in the Official Central Laboratory of Electrical Engineering (LCOE), guarantee IP66, IK10 and Class II categories in three territorial areas: national (N), European (ENEC) and global (CB). One of the most notorious weaknesses of diode technology is its sensitivity to overvoltages, whether caused by electrical grid maneuvers or by atmospheric or electrostatic discharges. However, ATP's LED luminaires are immune to these surges, thanks to their materials and their robust architecture. First, the company's products are Class II by nature and do not need grounding, which is the main way of entry of atmospheric discharges. Also, their entire structure is made from exclusive technical engineering polymers T5 and S7 instead of metal, which eliminates any possibility of electrostatic discharges. ATP has confirmed its attendance at the biannual Light + Building fair in Frankfurt, where it will have its own brand stand –hall 5, C44–. The company will showcase its new generation of high-performance LED ensembles with Laminar® Heatsink and Confort® Diffuser, two innovations that will shape the future of diode technology applied to street lighting. The main protagonist of the exhibition will be the revolutionary Aire® luminaire, distinguished by its sleek and avant-garde design with the renowned German Design Award 2018 and the Design Plus powered by Light + Building. ATP Lighting, will attend the Expo Lighting America (ELA) 2018 to showcase its latest LED innovations –stand 217–. This eighth edition of the ELA, whose main theme is "Light, Design and Comfort," will take place on February 27 and 28 and March 1 in Mexico City, at the Citibanamex center, and will bring together thousands of professionals of the sector. The COO of ATP Lighting, Guillermo Redrado, will also give the lecture "LED visual comfort: how to select the right luminaires?" on Wednesday, February 28, at 3:00 pm. ATP Lighting has recently obtained a grant co-financed at 50 % by the European Regional Development Fund through the FEDER Operational Program of Navarra 2014-2020, identified with the slogan "A way to build Europe". According to EU Regulation 1301/2013, the function of the FEDER fund is to strengthen economic, social and territorial cohesion in the European Union. Anti electrocution lamp posts, immune to corrosion street lighting and urban furniture, LED solutions with international patents: these are some of the keystones of this Spanish company which already exports to over 50 countries. Under the guidance of Guillermo Redrado, COO of the company, we explore the domains of ATP Lighting to get to know its innovative vision of the future of cities. The Cónica and Venus ATP Lighting's LED families have recently obtained the N, ENEC and CB certificates after the evaluation of AENOR, and thus complete the way started by Siglo, Plaza, Malaki, Villa, Villa Royal and Enur series. This new addition means that the entire LED catalog of the firm has now the maximum international quality guarantees. As it happened with the ATP luminaires certified before, the Cónica and Venus passed the tests required by AENOR in the Official Central Laboratory of Electrotechnics (LCOE), which prove their IP66, IK10 and Class II degrees. The three certificates, as a whole, have a global scope: the N is for Spain; the ENEC, for Europe, and the CB is recognized in more than 50 countries in the rest of the world. ATP stands out once again in the public lighting industry launching the revolutionary universal KitLED® with its exclusives Laminar Heatsink® and Comfort Diffuser®. This device allows to quickly, easily and inexpensively upgrade any discharge luminaire, from any manufacturer, to the most advanced LED technology on the market, only offered by ATP. With this innovation, the old light source is replaced by a highly evolved LED unit with its respective power supply, all perfectly adjusted to the street lighting ensemble to be modified. The different parts of the kit are assembled to make a single compact and functional block, with an adaptable attachment and an IP68 plug & play tubular connector specially designed so that the replacement is totally safe and can be done in a very short time. Another ATP Lighting's family of luminaires already enjoys the certificates N, ENEC and CB granted by AENOR, both in their versions of discharge as in LED. This time, as ATP recently advanced, it is the turn for the series of squared classics Villa and Villa Royal, which joins to the circular classics Siglo, Plaza and Malaki, and to the road and suburban luminaire family Enur. As in previous cases, the Villa has had to pass the tests required by AENOR in the Official Central Laboratory of Electrical Engineering (LCOE), which guarantees –among other parameters of electromagnetic compatibility, performance and technical safety– the IP66, IK10 and Class II of the aforementioned luminaires. We make contact with ATP Lighting, a Spanish company located near Pamplona, world leader in manufacturing street lighting and urban furniture of the highest quality from technical engineering polymers. Since its founding, in 1969, its vocation has been to develop the most advanced and durable products in its sector, and for that purpose, the enterprise has focused on identifying the main problems of outdoor lighting and solving them in an ingenious way through an intense effort in R&D. Anti electrocution lamp posts, immune to corrosion street lights and urban furniture and LED lighting solutions with international patents are some of the letters of introduction of this company that nowadays exports to over 50 countries. His innovative vision gives us an important clue about the future of street lighting. To achieve the sustainability of industrial activities and the long-term conservation of the planet, the commitment to the environment must be total: it is not enough to reduce polluting emissions or energy consumption, but is essential to fully control all the stages of the production process, down to the smallest details. This is the idea that motivated ATP Lighting to undergo voluntarily the audit performed by AENOR to be certified under ISO 14001: 2015 "Environmental Management Systems", which guarantees that every step that the company takes to develop and distribute its product is environmentally friendly and complies with all local, regional, national and European legal requirements. ATP presented its most recent solutions in LED outdoor lighting at the ELA 2017, held recently at the Citibanamex center, in Mexico. The Spanish company showed its latest generation luminaires with Laminar Heatsink® and Comfort Diffuser®, the two innovations created by ATP Lighting to solve the overheating of LED modules and the dazzling produced by this light source, respectively. The firm also displayed what will be its next main global launch: the LED luminaire Aire®. To complete the event, ATP's chief operating officer, Guillermo Redrado, offered the lecture "Reliability, protections and lifespan: key points for the choice of LED public lighting". As ATP promised last year, its family of road and suburban lighting ENUR just got the N, ENEC and CB certificates, in both discharge and LED versions. Enur 250, Enur L, Enur P, Enur Eco and Enur Micro series are thus added to the Siglo, Plaza and Malaki, which obtained the same distinctions a few months ago. These certificates, granted by AENOR once the products have passed the established tests in the Official Central Laboratory of Electrical Engineering (LCOE), authenticate numerous parameters of electromagnetic compatibility, performance and electrical safety, among which are the IP66, IK10 and Class II categories. Each of them, also, cover a different territorial area: national (N), European (ENEC), and global (CB, valid in over 50 countries around the rest of the world). ATP already includes in its LED street lights the exclusive Laminar Heatsink®, a unique system designed and internationally patented by the company to solve the overheating inherent to LED and thus extend its lifespan. This device, which unlike fin heatsinks is flat and super-slim, reduces the working temperature of the LED panels by 21 % and prolongs their life over 21 000 hours. Given that the annual average operating time of street lighting in Spain is 4100 hours, this means lengthening LED lifespan to nearly 25 years. 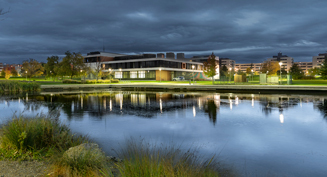 ATP Lighting, the world leader in manufacturing street lighting and urban furniture from technical engineering polymers, has recently obtained the N, the ENEC and the CB certificates for the luminaire family Siglo (Siglo, Plaza and Malaki series), both in their discharge and LED versions. These distinctions, granted by AENOR after passing the required tests in the Official Central Laboratory of Electrical Engineering (LCOE in Spanish), validate, among other parameters (quality, electrical safety, electromagnetic compatibility and performance, for example) the IP66, IK10 and Class II categories of the mentioned series in different territorial areas: national (N), European (ENEC) and in over 50 countries around the world (CB). 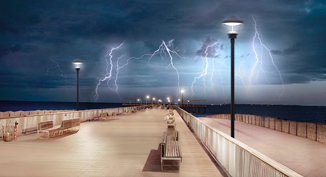 Again, ATP lighting proves to be at the forefront of technique in the field of public lighting and street furniture: the company has recently become the first licensee of the AENOR N Brand for outdoor lighting poles of steel or aluminum. This certification guarantees the degree of protection IK10 of the mast and the access panel, plus the category IP66 for the pole-access panel surrounding. Thus, not only the ATP are hermetic and vandal-proof, but the masts produced by the firm also enjoy such unique features. Another award adds to the long list of prizes granted to ATP by the superb quality of its products and its respect for the environment. In this case, we talk about the ISSOP seal (Sustainable Innovation Without Planned Obsolescence, in Spanish), issued last January by the Feniss foundation to a select group of companies which manufacture items designed in order to last and to work smoothly as long as possible. Of these, ATP is the only member of the public lighting and street furniture sector, which gives an idea of ​​the excellence achieved by their products and shows the distance from other corporations in the same industry. How can a LED street light keep its performance and simultaneously suppress the glare? This question represents a challenge that has surpassed the industry since light emitting diodes technology broke into the public lighting sector. And, finally, ATP has found the answer through an R & D effort: the revolutionary Comfort Diffuser®. Created using the exclusively formulated T5 polymer and specially designed to mitigate the glare of the LED while maintaining a maximum light output ratio, this unique diffuser is called to inaugurate a new era in the world of latest generation outdoor lighting. Designed to be the top of its category (suburbans of low and medium heights, up to 19 feet), the groundbreaking street light Enur Micro offers the highest technical performance, cutting-edge appearance and durability with no parallel. Either in LED and discharge lamp versions, everything in it is conceived to achieve standards of excellence: materials of an outstanding toughness that do not require maintenance, devices that warranty total tightness of internal elements, maximum efficiency, optimized energy savings and complete clearness. Furthermore, the equipment takes into account the environment and promotes sustainability: it does not generate any light pollution, and its components are 100 % recyclable. The first phase of the Oviedo Council's plan to replace the streetlights of the city has already concluded: it involved the installation of 1466 Siglo XLA LED fernandine lamps, including the revolutionary Comfort Diffuser®, along 39 streets. With this performance, ATP has improved the city night appearance and achieved substancial energy savings: the new equipments provide the streets with a clear, clean and colorful image, while they economize more than 70 % of power consumption.